From the backstreets of Bow to Brit Award success and broad mainstream acceptance, grime has found remarkable success in recent years. Dizzee Rascal and Tinie Tempah have established themselves as bona fide pop stars, while the music's rougher edges were sanded down, lyrically and sonically, and remoulded into playlist-friendly singles that retained enough spike to graze the listener's ear with a touch of the 21st century British inner-city experience. Yet listening to the disco bounce of Dizzee's Holiday, we're tempted to forget that before the fame and riches he was eking out a life fraught with danger, an existence documented on his first album, where his concerns were more immediate: the level of violence on the streets and the petty bellicosity of local gang rivalries. Many not yet fortunate enough to land a record deal remain in the same situation. Simon Wheatley, a Magnum alumnus, was originally drawn to east London in 1998 to photograph the architecture, but soon changed his focus to the nascent musical subcutlure. In this book, the culmination of a 12-year project, he captures it all: the crumbling council houses and teeming groups of MCs battling for the mic, the cheap chicken and camaraderie, the run-ins with the law. His focus isn't, for the most part, on those who make the Mercury shortlist but mainly on those left behind with aspirations and frustrations. The fine line between the two worlds is perhaps epitomised by the book's cover star, Crazy Titch, a promising rapper who flirted with mainstream success in the mid-2000s currently serving a life sentence for murder. 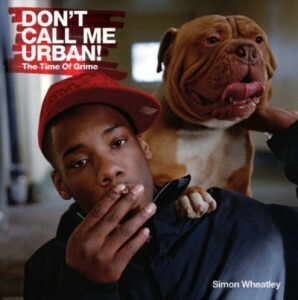 The book is a fine document on the seeds that gave birth to London's urban music scene, and it is to Wheatley's credit that his study doesn't come across as condescending or exploitative. Don't Call Me Urban! The Time Of Grime is out now from Northumbria Press.